Click here for The Clothes Show 2015 Giveaway. Click here for a promo code. There has always been a strong link between fashion and beauty, and as trends in clothing change, so to do the beauty products and makeup colours designed to complement your style. In recognition of the strong relationship between these two, world class event The Clothes Show has expanded its reach to include a greater range of suppliers and products for your pleasure. 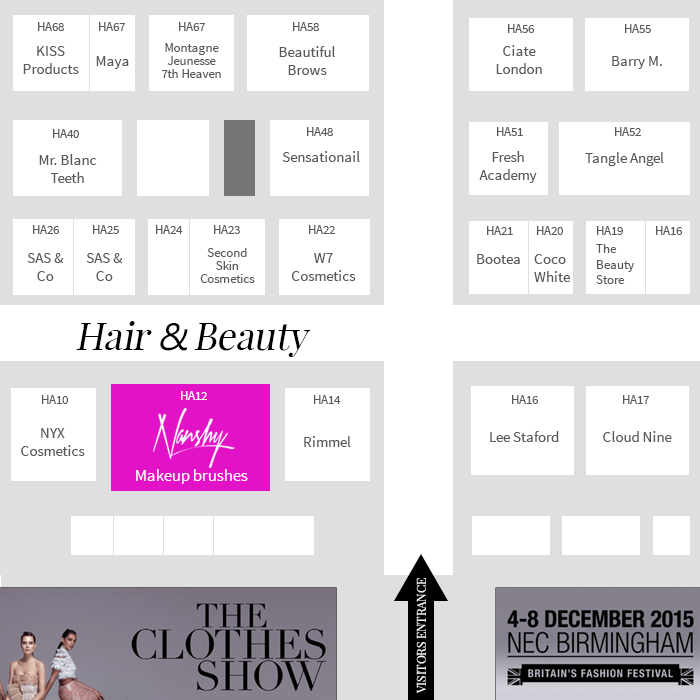 Due to take place on the 4th to 8th December 2015, Nanshy is super excited to announce that we’ll be right in the middle of the action, on our stand at HA12 next to Rimmel and NYX. We can’t wait to get to The Clothes Show and meet our fabulous fans, so do come along and say ‘hello’, whichever day you’re planning to come. What is The Clothes Show? If you love fashion, you’ll almost certainly have heard of The Clothes Show. 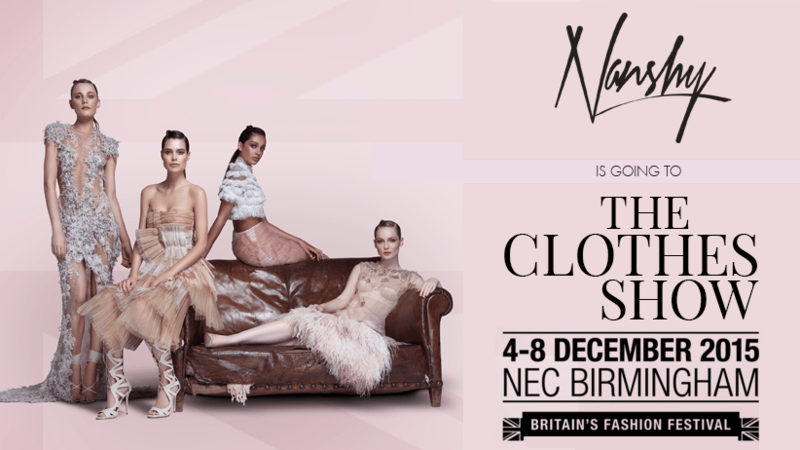 Held annually at the NEC in Birmingham, this is the UK’s leading event for everything about clothes, fashion and style. Presented by celebrities and featuring live performances form some of the UK’s most exciting musical talent, it’s one event that has a firm spot in the diary of every fashionista in the country. Launched in 1989 on the back of the popular TV show of the same name, the event attracts over 150,000 visitors every single year. Established model agencies often use the show as a hunting ground for new talent, and famous faces such as Cat Deeley and Holly Willoughby have been plucked from the crowd in the past. This year, The Clothes Show has secured sponsorship from tech giant Alcatel OneTouch, and is promising to be bigger and better than ever. Leading the line-up for 2015 are four gorgeous British models, Erika Pattison, Sarah-Ann Macklin, Hannah Dodd and Rhiannon Laslett, collectively known as the ‘Brit Pack’, and who were all scouted at the show over the last decade by Select Model Management. What happened to the ‘live’? In line with the significant improvements, investments and changes to the old ‘Clothes Show Live’ format, the event has rebranded itself as ‘The Clothes Show’ for the event in December 2015. The overhaul is not just in the name either, and avid fashion fans can expect an altogether better event this year. 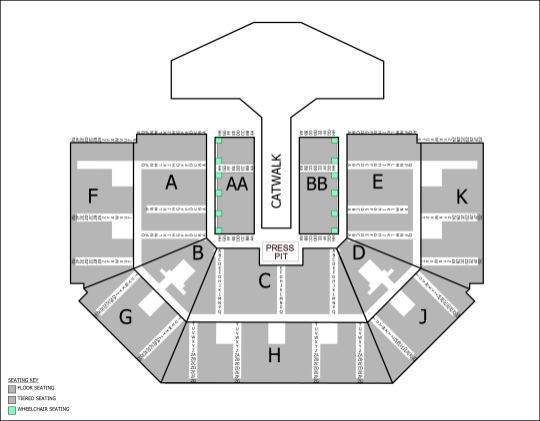 The layout has been improved to give a better flow throughout the event, and there are new and innovative features built in which will enhance your catwalk, shopping and seminar experience. In light of the strong links between fashion and beauty, you can now find more of your favourite brands here at the event for 2015. Over 500 high street, boutique and designer brands will be housed in newly curated sections, helping you find your favourites and discover new products more easily. What’s going on at the event? The Clothes Show has always been peppered with juicy celebrity appearances, and this year is no different. You’ll find a delectable selection of style gurus every day, from Antonia O’Brien and Caryn Franklin to Binky, Joey Essex, Hilary Alexander and more. Musical delights include Charli XCX, Urban Voices Collective, Ella Eyre and many others. Don’t underestimate the potential to get scouted at The Clothes Show. Many others have already been spotted this way, and have built healthy careers on the back of being in the right place at the right time. Select Model Management are this year’s only official model scout agency, and you can visit their stand at the show for advice on getting into modelling as a career. In addition to the veritable plethora of clothing brands at the show, this year you’ll be amazed by the range of hair and beauty brands which are featured. As well as your favourite brush maker Nanshy, you’ll also find Models Own, Elemis, Rimmel, NYX, Barry M and much more in their own curated area for your shopping pleasure. See the full list of exhibitors here. If fashion is more than just a passion for you, don’t miss the enlightening seminars taking place over the course of the show this year. The Fashion Career Seminars will be led by Caryn Franklin MBE, where students can learn about the career journeys of a range of fashion pros. From journalists to photographers, designers to models, this is the place to get the inside track on your fashion future. This year’s image catwalk will bring you the latest trends, high street collections and catwalk shows from graduates and up and coming designers. Presented by Antonia O’Brien, Jamie Laing and Joey Essex, all tickets come with a ringside seat (check the seating plan here) for the incredible catwalk show, so don’t miss out on this highlight of the event. As you can see, the event promises to be a feature packed feast of fashion fabulousness, and one not to miss if you’re serious about looking great. Get the full lowdown on everything happening over the five days of the event right here. We want you to get the best out of your day at The Clothes Show, so here are some insider tips to help you get the very best from this year’s event. Buy your ticket soon to avoid missing out. Use code “TX342” for 3 for 2 ticket offer. The latest code also available at the HotUkDeals website. If you’re a Tesco customer, you can get a ticket to The Clothes Show with just £10 worth of Clubcard vouchers. If you can afford it, get a Platinum ticket… the goody bag alone is worth the price difference! We’re literally chomping at the bit to get our teeth into The Clothes Show 2015, and hope we’ll see you there as well. We’ll have our brand ambassador and makeup guru, Barrie Griffith, on the stand on Saturday and Sunday, and he’ll be joined by the gorgeous beauty expert Nikki Taylor to answer all your burning questions. Find us on our stand at HA12 throughout the event, with exclusive offers on our world class super-soft brushes for our fans on the day. See you at The Clothes Show! Yes, I try to go each year if I can as I like to have a play with the makeup and brushes before buying! I’ve never been to the Clothes Show, my sister has and loved it so hoping to go myself one year as I am a make up addict! No I have never been, but I’d love to go! Amazing prize. I would love to go and take my mother in law. I went a few years ago with my friend, we had a great day out. yes but only once! would love to go again! Haven’t been in 5 years!! Would love to again ???? Good to see you there! I’ve never been! But i would love to go! I have never been but have enjoyed other Nec shows. I’ve never been but would LOVE to go. Yes I’ve been twice before (the last 2 years) with my big sister! Never been to the show before and it would be an amazing oppertunity to go! And I would love to try out and review your brushes on my blog ???????? Eek! I would love to treat my sister to this! I have been on school trips when I was younger. I am 33 now though and would love to go again. I would love to experience this clothes show. ive been once before and i absolutely loved it! I’ve never been, but would love to go!